Image courtesy of Danielle Levitt/A.L.C. The collection focuses on the Cortez sneaker, made famous by the photo of Farrah Fawcett skateboarding in the shoes in 1976. While the feathered hair of the former Charlie’s Angel has not maintained, the classic rounded toe and long, flat-soled profile has. Three motto’s from the A.L.C. 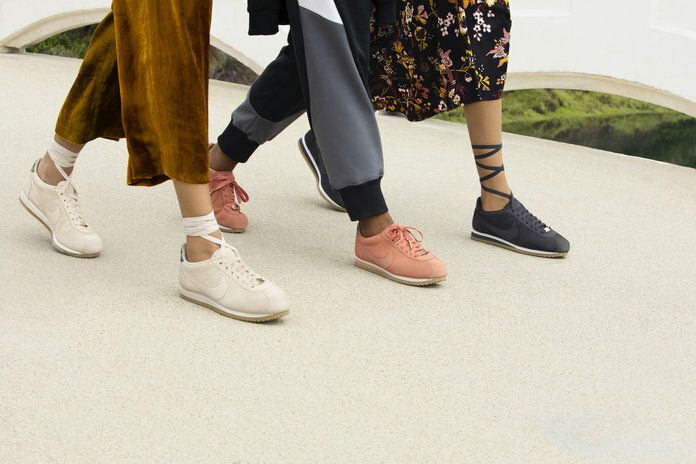 brand, “Love More,” “Do It, Own It,” and “Think How You Can,” are emblazoned on the inside of the newly redesigned sneakers, which come in three fresh colors: Oil Grey, Light Orewood Brown, and Terra Blush. Brass hardware, snakeskin and suede uppers are among the details Lieberman used in this new design. The shoes are shown in one photo styled three different ways – laced up to mid-calf, looking like ballet shoes in the Terra Blush; the long laces looped around the ankle numerous times; and tied at the tongue of the shoe as we are accustomed to seeing. Retailing at $100 a pair, the shoes will be available at Nordstrom the Grove on August 25, and starting August 28 the collection will be available at alcltd.com, Net-a-Porter, Nike.com, the Nike SNKRS app, and select Nordstrom stores. Lillie is a graduate from UC Santa Barbara with a bachelor's in Classics and a lifelong fascination for fashion and art. A freelance writer and artist, her hobbies include photography, design, drawing and blogging.